Prestige Casino is no longer available . Click here for alternative casinos . Prestige Casino offers 40 progressive jackpots which could make you an instant millionaire. Choose from Roulette, Slots, Caribbean Stud Poker, Jackpot Carts, and many more. 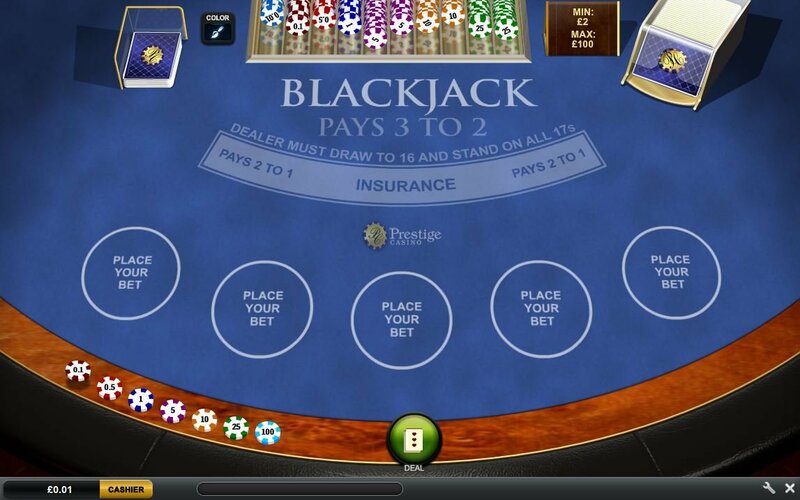 You’ll also find plenty of additional bonus features within each casino game. If you’re familiar with the Playtech gaming software you’ll recognize Prestige Casino software’s look and feel right away from playing other casinos powered by Playtech. As is the case with many other Playtech Casinos, you’ll find some of the best quality graphics on the market along with entertaining themes. On the down side, many games require additional download even after loading the software. But Patience! These games are worth the wait! 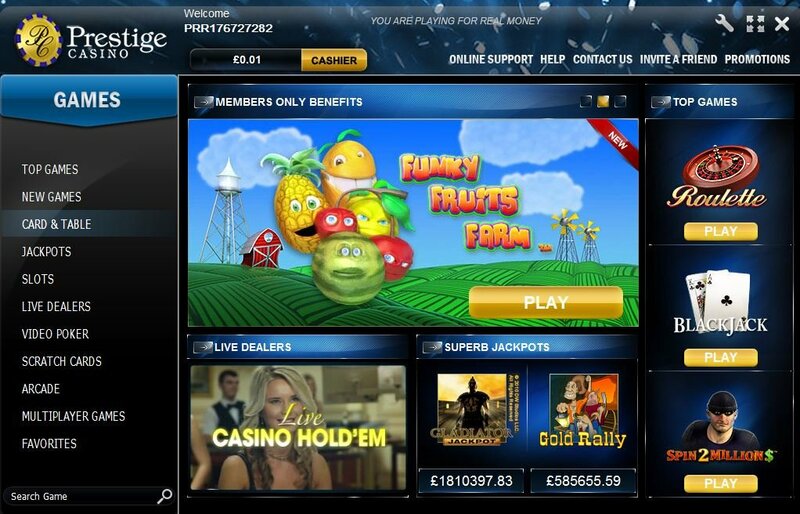 Unlike many other online casinos which allow you to play their games instantly from their website, Users must download Prestige Casino software. On top of that, most games require additional download even after loading the casino software onto your PC. Prestige Casino jackpots include 40 progressive jackpots including Roulette, Slots, Caribbean Stud Poker, Jackpot Carts, and many more. So get spinning and start winning! 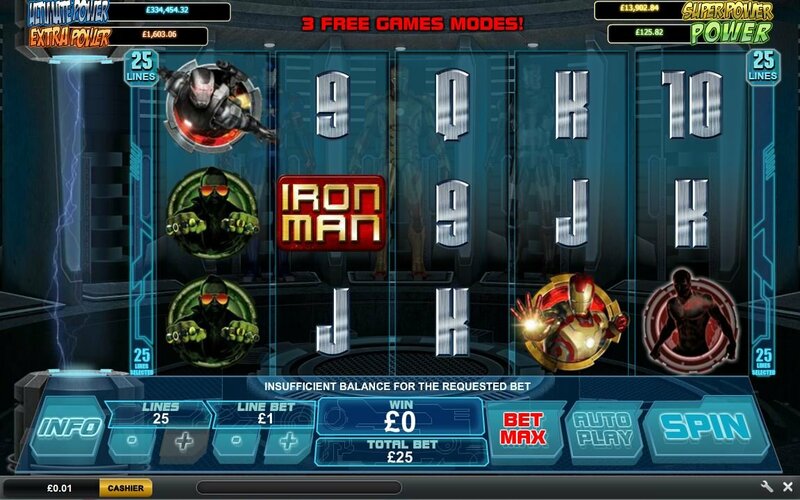 Don’t miss out on the Iron Man 3 video slot. This 5-reel, 25-payline slot machine come packed with bonus rounds, scatters, wilds, free games, and multipliers. The game even puts you in the running for four of the famous Marvel Slots Jackpots. All Marvel Slots link to four mystery progressive jackpots: power, extra power, super power, and ultimate power. Talk about slot games of epic proportions! Play Prestige Casino where you can access one of my favorite video slot machines, Halloween Fortune. Prepare to have a hair-raising good time with this 5-reel, 20-slot game. Halloween Fortune perfectly captures the essence of this beloved and “spooktacular” holiday. The online offers a supernatural video slot that both entertains and let’s players cash in big. Prestige Casino offers some great promotional deals. They reward new players with $1,500 just to try them out for the first hour. This is in addition to their Welcome Bonus of $800 after your first deposit. Prestige Casino offers some great promotional deals. They reward new players with $1,500 just to try them out for the first hour. This is in addition to their Welcome Bonus of $800 after your first deposit. Check out Prestige Casino Promotions to find out more about the many great bonus offerings. Those who chose Prestige Casino as their home base for online gambling should definitely consider joining the Prestige Casino VIP Club. Members of the Prestige Premium VIP Club enjoy extra bonuses, benefits, and special offers. Here the more you wager, the more rewards you will receive. They claim to offer a large range of payment methods, but I found it difficult to navigate their site to see a full list. Usually other casinos clearly state their “Banking” options on the website. After speaking with a customer service representative, they directed me to a section called “Cashier” which clearly lists all of the available payment options. In order to make deposits and receive payouts, Prestige Casino accepts Ukash, Click2Pay, Neteller, and Local Bank Transfers. If you have any questions or problems with Prestige Casino, they offer five different options to receive customer support. First of all, you can receive an immediate response from one of their customer service agents from their Live Chat support in the casino lobby. When I accessed their Live chat, an agent named Jet answered my questions in a matter of minutes. They also provide contact information to speak to operators via email, telephone, fax, or post. What’s the best jackpot on Prestige Casino? Right now, Gold Rally slots is almost up to $1 million for the big jackpot! Since they are progressive jackpots, the jackpot payouts change all the time, depending on how many people play. The more people play, the higher the jackpot until someone wins. So I guess it really depends on which games you like and the payout at the time. It’s good to take a look at the jackpot counters too before playing.